Everyone agrees that minivans are lame. Anything associated with suburban child rearing tends to get that stigma. But Ford's Euro spec Transit Custom and Tourneo Custom will look pretty awesome to someone who has to schlep around a lot of gear or people. Introduced as a concept at the Geneva Motor Show, Ford just announced the official release of the two large-ish, kinetic styled vans that we can't have in the states. Like it or not, this is a Euro-only affair. Larger than the front wheel drive Transit Connect, the Transit Custom and Tourneo Custom — Tourneo is Transit's more plush, passenger oriented sister — powers the front wheels with a good-luck-ever-seeing-that-in-the-U.S.-of-A. 2.2-liter Duratorq TDCi diesel engine. 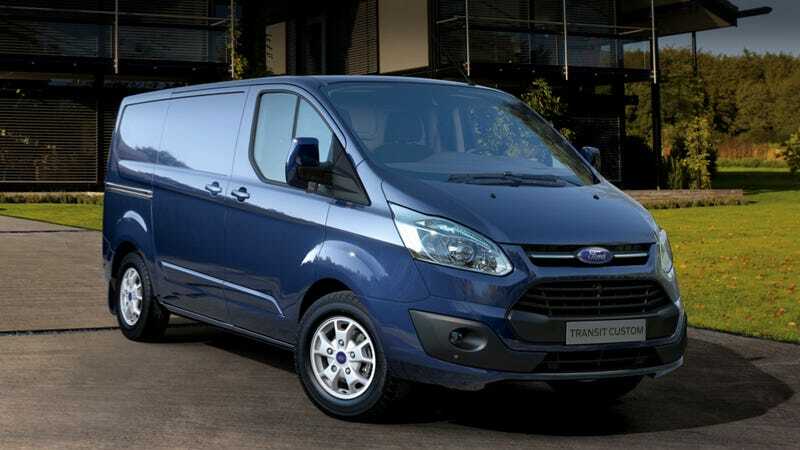 Ford claims the larger Transit gets 36 mpg, which is pretty good for any vehicle, let alone one that can carry 10-foot-long pipes and three pallets stacked with Euro goodies inside. The Tourneo gets the same mileage, but is outfitted with plush seats and windows so that convention participants don't feel like they're being kidnapped by the Taliban as they're whisked to their hotels from the airport. Personally, I'm salivating over these vans (especially the paneled Transit), and wish we had one here. It would fit long surfboards and skis and camping gear, and possibly two or three slumbering bodies. It's the (reliable, fuel efficient) Volkswagen bus my generation never had. Now if only one of those money wasting bastards on K street can do something useful for a change and lobby Congress to get rid of the Chicken Tariff, maybe it would be easier to get a few of the Turkish-built Fords into the country. In the meantime, Ford should listen to Jason Torchinsky and give us a Transit Connect cruising wagon. A RWD version is coming to to replace the Econoline soon, so don't fret America.